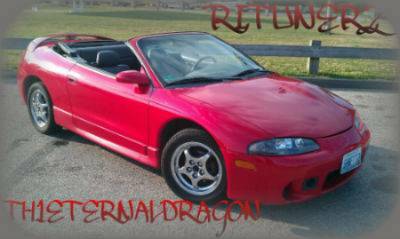 As most of you know I recently bought a 1995 Eagle Talon Tsi.. fwd.. It is, or was an amazing car. I have already had to replace the alternator and I still need to replace most of the gaskets, just for piece of mind. Currently it has a Walbro 255lph fuel pump, true Greddy bov, FMIC, Injen hard pipe and filter, Thermal cat-back, boost gauge, oil pressure gauge, a/f gauge, ADR M-sport classic 19x9.5rims on Falken 19-35-245 skins. I also have a cat-less dp that I am waiting until after inspection to install. My plans if I can get it running again is to do the evo 3 16g turbo, TUNE, and FIC 650cc injectors. Thats all for now! Hahaha I have driven by it everyday while its been at the shop to check up on her... Cant wait to nail her again!! !